This is a project boat with the floor and bulkheads installed and the majority of the interior roughed in. Looks 85% complete to me. Are those cleats or ladder rungs? One would hope for at least one nautical accessory mounted in the unfinished cabin to get to the magic 85% but I'll give it a pass due to the sheer number of proper brass portholes, and the notion that if this thing really was started in 1988, it's properly well seasoned. The key point is that you pay $1500 for the motor by itself but if you take the boat you can get it for $1000. I'm not mocking the lister as this is a proper honest ad, but it does underline where the market is at for small and old-ish sailing craft. Maybe things are different up there but a ten year old ten horse engine can't be sold for $1,500 around here. I kind of like it. It seems to have one too many portlights. It might bring that price if completed. As is? Far less than the value of the engine if you just remove and sell it. Multi tiered bull rail. All hail. I think the price for that motor is optimistic. Our sailing co-op has 6 Catalina 27's, all powered by Yamaha 9.9 high thrust (electric start, X-long shaft). Retail new is about $4500 Canuck bucks. We sell one off each year at 6 years old for about $1500. Not really all that mockworthy but overpriced a bit and has that magic number. At least with the Glen-L you get a mast. You need a boat to get to the project on Gabriola island. It seems sad, that one. More than thirty years old and never kissed the water. 85% is wildly optimistic. It does have the potential to actually sail in this lifetime though. So your saying it has an 85% chance of sailing in this lifetime? I'd say more like a 15% chance. Nice old boat until you get to this pic of clashing fabric and busyness. Sure to offend Bull City and others. How hard can it be to pull those off and get rid of the Walmart mats. Yes we know where they are from. Depends on the (potential) buyer, I 'spose. Epiphany!!! The next dreamer that wants to build a world cruiser could be sentenced to finishing this project. That would be a wake up call, LOL. Unfortunately that is closer to the truth. I'd like to see it turned into a parent-child project. Buy it for $500 procure new fiberglass, resin, paint and consumables and if lucky be all in for $1,000. Somebody is on blue micro dot again. 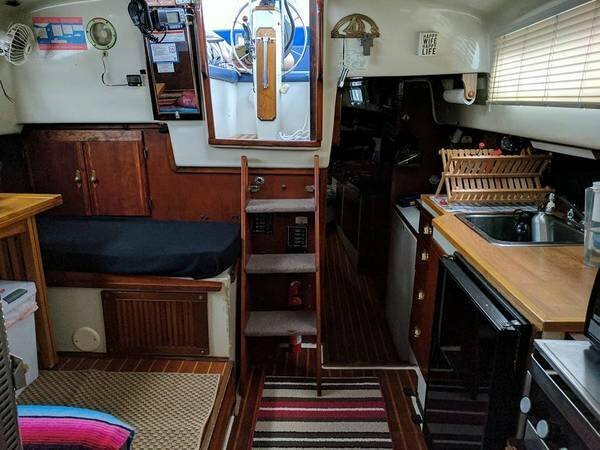 So is the companionway offset, and then the ladder offset as well? The mizzen can be removed without affecting balance or performance. A 6' tall person can't stand in the galley. They're sorta nice but Irwin attempted to stuff a 42 footer into 37 feet and it doesn't quite fit. Not sure how mockable this is. Does anyone know what it is? 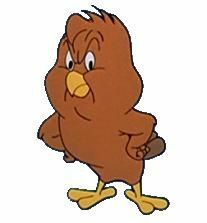 Com-Pac 16 ? If so, sturdy construction, under-rigged. I think you're right. Might belong on the not mocking thread. I'll let you know. Under rigged, but that blue propane bottle will last you all summer. Exactly! 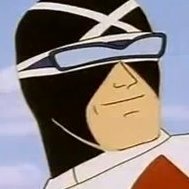 Trailer appears to be decent. Using a propane bottle as a sawhorse is not recommended. Is FloTec or Amtrol (water well) pressure tank. Can we also agree that the hull shape is fugly? Yes, it sure looks like a 16 to me. Israel, it's a lot less ugly in the water where you can't see that keel. They sold a zillion of those and it's the boat the kept the company alive right up until they found they could not compete with the used ones they had already created. Then it was replaced by the Sun Cat. But some people feel the need for a jib and don't wish to put one on a catboat, so they retooled the old 16 and it's now the Legacy. It's kind of a neat little boat and it's possible, if frustratingly slow, to sail it back to the ramp in light air if the shop guy told you he put gas in that outboard but did not. But enough from my list of things I know, but should not. Trailer sailors are a bit like work boats. The question is how well they squeeze the design goals into an easily rigged package able to slide off a trailer while complying with road legal beams. The compac 16 is a small daydailer or overnighter for a flexible person. It is safe for the novice or occasional sailor. Pleasing lines that interfere with function are a detriment. Interior accommodations, storage, bunks, cockpit space, sea kindliness, speed by and large, pointing, stability, righting index... Its hard to squeeze more then a couple features into 16’, or a handful into 22’. I submit that’s why all the home designers and builders we critique limit themselves to larger vessels. 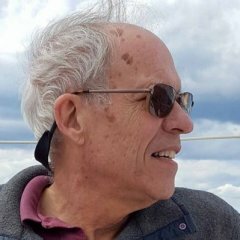 I’m still waiting for the carbon fiber trailerable design with walkable replaceable deck solar cells that has a good ballast ratio but doesn’t sacrifice anything else. Bob Perry, you can skip the pilot house if that helps. I always found the Compac's to be well built, salty-looking boats. But, lordamighty, they sail like dogs to weather. I find their owners admit that too, The lack of centerboard well allows a decent open interior, but there is a penalty. In many ways the Compac 16 is an awesome boat. They're not supposed to look like 12-Meters, they're supposed to look kinda "ship-y" with bronze ports, and cute in a kinda pudgy way. They don't have to be fast because the sailor is already where he wants to be. They are really little, though. Way way back when, Mrs Steam and I shopped around for a trailer-sailer. A neighbor was selling a Compac 16 and even though I was fairly sure it would not do, for us, we went and looked at it. We could both squeeze into the cockpit. I don't recall us both squeezing into the cabin at the same time. They're easy to trailer and really quick and easy to rig up. There's a reason why so many guys like them. They sail way WAY better than the Stevenson Projects faux-boat. You found the exception. I’m in awe at the.... something....... Clearly the builder wanted what none of the many manufacturers had managed to achieve. A 19 near me is named “puddle pirate”. It has a couple hundred miles on the Great Lakes from a prior owner. The couple upgraded to the 23 so they must have liked Compac. The fittings and wood lend them character. Vacationing in Dillon, Co, I noticed a number of Com-Pac 16s and similar on the lake. They get strong winds there when gusts slide down the mountains. Wow! is that a bulb on the larboard (advanced) or did he just steal a leg off a big Johnny Walker cutout? Those are called williwaws - used to get big ones on the lake I learned on. You quickly learned to watch for the outflow of gullies & ravines along the shore - they were total wind chutes. Whose lifetime are we talking about? The boat's? 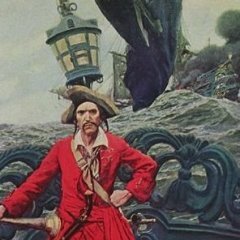 As a former Coronado owner, I found this humorous and interesting. He's also including a car and take over the mooring. 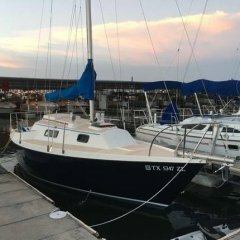 Sounds like a turn-key, tiny home life, just fork over the 8 grand and move aboard. The ad should include the latest in buzz words though, tiny home should certainly be in there a few times. He should also talk about getting the hell out of Alberta several more times in the ad. Maybe put a picture of Jason Kenney in as a reminder. This is epic. Check out 2nd to last photo in the ad. Maybe it's a French thing (boat is in France). 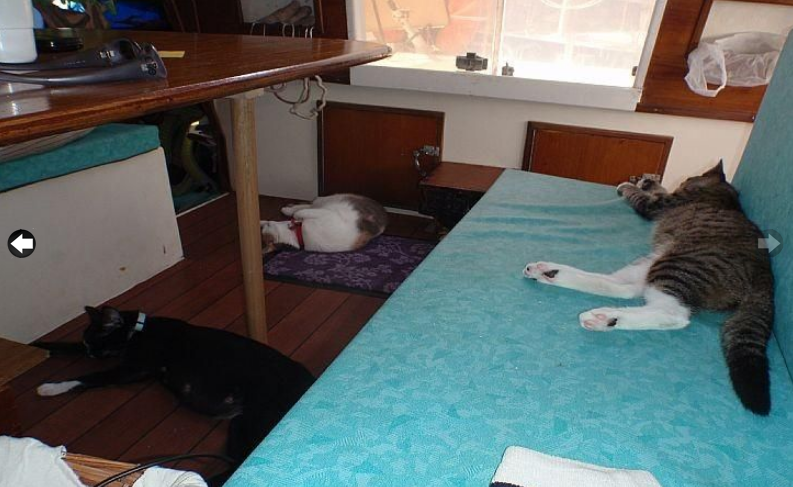 Who can't be bothered to move THREE cats out of the photo when you are trying to sell it? ^^^^ Maybe the cats are part of the package. I think it adds character. But I am a cat person to begin with. And there's a poop deck! Who knew? 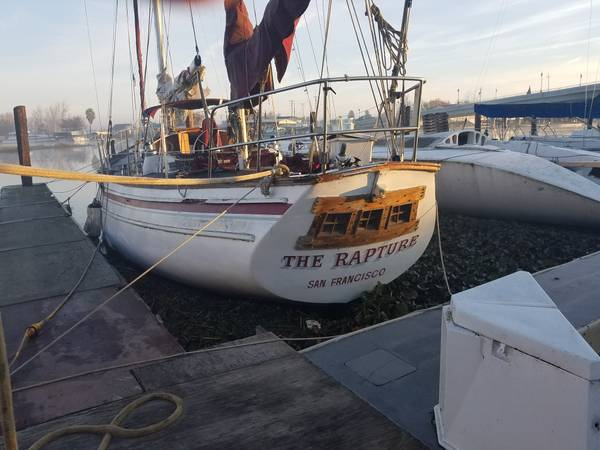 Not mocking the boat per se, but this guy just bought this boat for somewhere in the neighborhood of $2500 a few weeks ago, moved it to a relatively remote location, and now is hoping to triple his money! 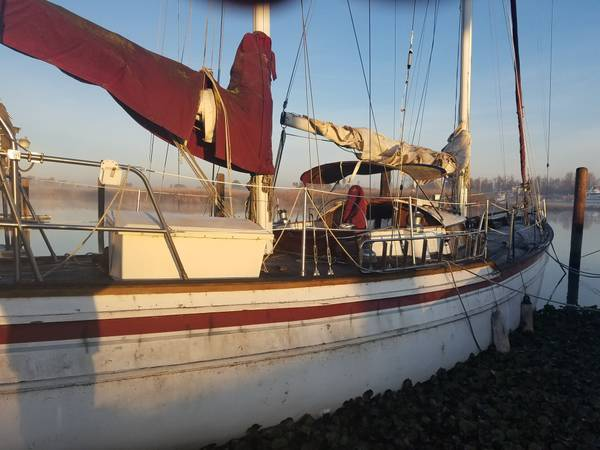 The boat was languishing on the market when the previous owner was asking a lot less for it. 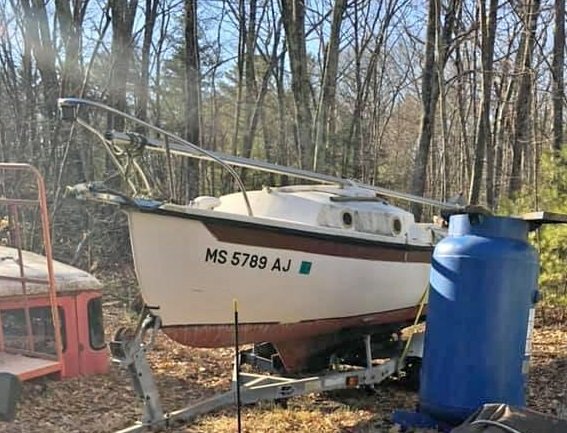 It seems to me that trying to flip old craigslist boats is a bit of a fool's game...I'll be interested to see how long it is listed for. I would think your only chance of success at that would be to buy in the dead of winter and list when the sun comes out in the spring. Spending the interim cleaning it would help a lot too. Does this go with the cat boat (the boat with the trois cats that is)? 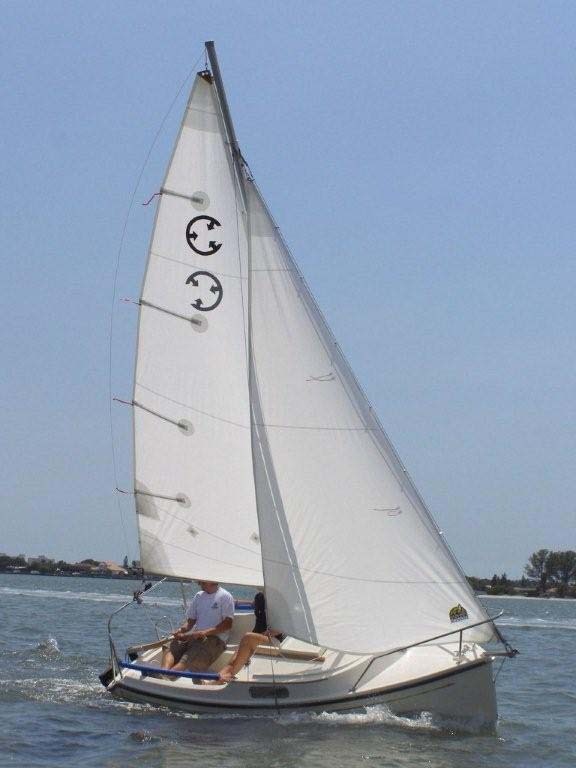 Interests:Sailing, aviation, flight simulation, kayaking, cruiser motorcycles, anything DIY. Have you ever tried to move one cat, much less THREE? I met a millenial who thought he was making a living by buying stuff from Amazon and selling it on Craigslist. Cats and Dogs are pretty good at photo-bombing every conceivable image. But... there are four cats in that picture. You have a problem with herding cats? I like cats too, and boats, but not cats on boats! I can almost smell the litter box when I see that pic. Besides, cats hate water. Fortunately, it is in decent condition! Gosh that boat name suggests keeping a considered distance at cocktail hour - bright-eyed evangelicals in a state of near permanent ecstacy are an acquired taste . . .
Ooooooh, Another Sailor whats that next to Rapture? Looks like a neglected but interesting cat, not the furry kind. Give us a report if you're in the area. More pics of that please? Thanks.